Years ago, I read somewhere that you can make a nice dip from a jar of artichokes. I don’t remember where I read it, or what was suggested to go with the artichokes, but I remember that I read it some time ago. This past weekend I tried it with celery and cheese and it was a success. And certainly I will try again, adding different things (grilled zucchini?) and taking out other ingredients (no celery?). If I’d had green olives I would have added them. Because the artichokes had salt added already, I didn’t include salt. Here’s how to make this easy dip. Combine 3/4 of the chopped celery with cheese, artichokes, and black pepper in the bowl of a food processor. Pulse to combine everything, then run the motor fully while adding a little olive oil to bind everything. 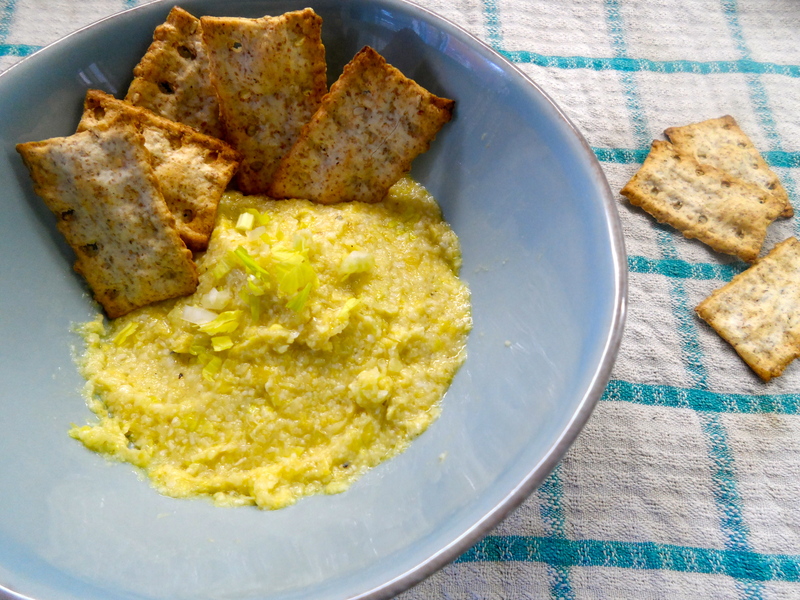 Use the remaining chopped celery & leaves to garnish the dip. Serve with crackers, flatbread or other crispy, crunchy bites. I used up the last bit, by spreading it on a toasted bagel. Let me know if you make this dip -with mixed and matched ingredients- to success. Previous what’s in your fridge?